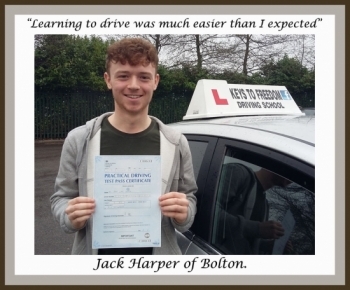 Driving school Bolton, customer reviews. Our Driving School Customer Reviews. We are committed to your success in learning to drive and passing your practical driving test in as short a time as possible, and with as few driving lessons as possible, so as to save you as much money as possible. These reviews are from local people who have previously taken their driving lessons with us. "I didn´t feel under pressure during lessons." "My instructor had confidence in me"
"I would definitely recommend Keys to Freedom." "I can now drive with confidence." "Learning to drive was much easier than I expected."